grandma's cookie jar: crafting with grandma . . . Pine Cone Birdfeeder! It is Fall and if you live where there are trees such as I do - in West Michigan - the outdoors is ablaze with color! I used to think Dr. Seuss had an amazing imagination . . . which of course he did . . . but he often pictured very colorful trees in his books. However, if you look around Michigan in the Spring and Fall, you most certainly will see an abundance of very colorful trees all around! Maybe Dr. Seuss lived in West Michigan! On your next sunny day, take your grandchildren for a walk to enjoy the amazing colors of Fall! Talk with your grandchildren about how God created the trees and spend time thanking and praising Him for giving us trees. As you walk, talk about which trees they think are the most beautiful and collect a few leaves. Be on the look out for Pine trees and look for some "open" pine cones - collect these as well! 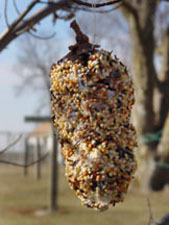 When you get back home, set out the "treasures" you found and add a few simple supplies to make pine cone birdfeeders . . .
Talk with your grandchildren about the birds God made and if you can, find a bird book and look up which birds live in your area . . . keep the book handy so you are able to identify the birds as they come to your birdfeeder!